Don’t Settle for Mediocrity – S.J.A. As some of you know, this has been a ROUGH 18 months to say the least. Lots of ups and downs, bumps and bruises, cuts and scrapes. The ones who know me best know that no matter how many times I fall, I am always going to get back up again. Others seem to think that I am living a charmed life which is far from the truth. What I am living—and have been living long before it became a popular song—is my best life. 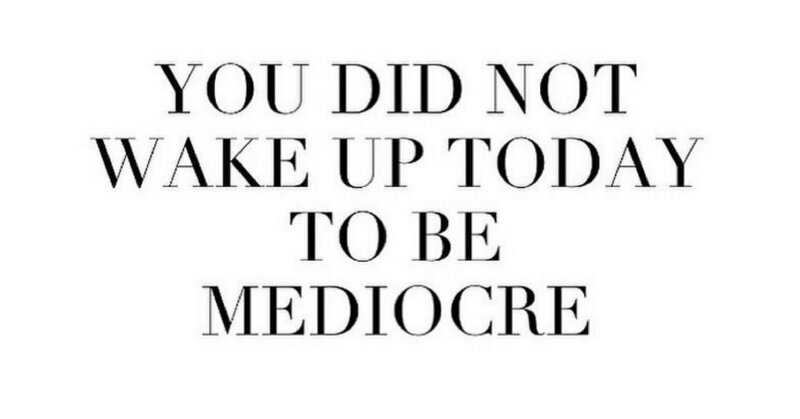 I decided long ago that settling for being mediocre was NEVER going to be an option in my life. For that same reason, my circle is very small. People around me know that I expect everyone to strive to be the best version of themselves. Self-work isn’t for everyone…I get that. But when you choose to settle for the easiest life, you become accustomed to being mediocre. You do yourself and the world a grave injustice. I hope this list will shake you up and get all the good stuff out of the bottom of your life’s glass and into the mix. You owe yourself EVERYTHING. You are too everything to settle. As you walk in your purpose, do not accept littleness in the place of your magnitude. The power of the Most High within you will support every effort you make to walk in your purpose. Remember that God offers his glory to the world through you. Neither give nor take mediocrity. When you choose to half-step or do anything in a mediocre manner, this is your evaluation of yourself. You have judged yourself less worthy. Mediocrity will never make you content or give you peace. Don’t surround yourself with a tribe of mediocre people or all you will ever do is “measure up.” No one rises to low standards. Spoken by a true warrior, such a great young women. Love you! Thank you Babe! Love you too!